If you are already using the new EVE Launcher, you donGÇÖt need to do anything extra and can simply continue using it at your leisure. 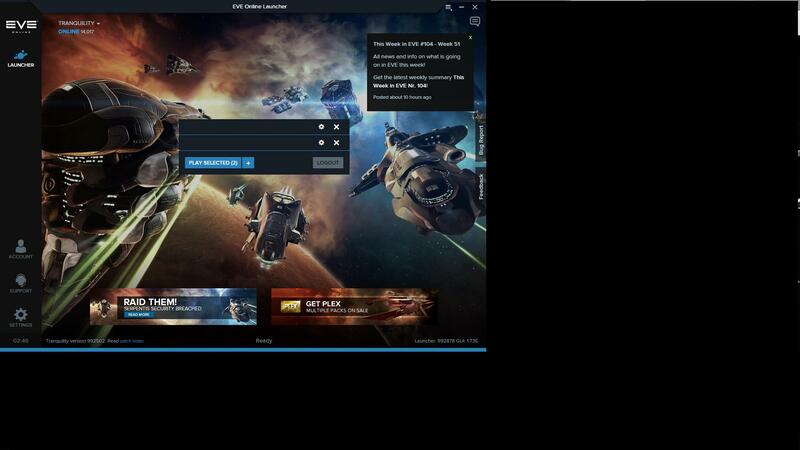 While you can continue using the classic EVE Launcher, we recommend that you switch over to the new Launcher (not available for WinXP). "Those who talk donGÇÖt know. Those who know donGÇÖt talk. " "(...) I am tormented with an everlasting itch for things remote. I love to sail forbidden seas (...)"
"Here in the garden of the arcane delights dark shadows overwhelm us and and we become blind..."
On the Mac version of the launcher each instance of the client spawned has the same name. With multiple accounts, tabbing between them becomes confusing. I would like to request that each client instance be named for the profile that it launches with, so when you are tabbing between applications you can easily tell which character you are tabbing to. Neither of the two issues I reported here are fixed. What about us poor impoverished Win XP users? Or is this going to be the point of upgrade or quit? So hum, this new launcher seems cool. But first it fails to update itself automatically (when the beta launcher starts updating, it close itself, then an empty console appears and does nothing). And second when you manually download the new launcher, this thing refuse to install itself in an non-empty folder. Thanks Sherlock, I know this folder isn't empty and that exactly why I want you to install there, I don't want to download whole EVE again. My launcher is hanging. When I load the launcher it says 'please wait' for aprox 2-3 mins. However I can input my username and pw into the launcher while I wait. After 2-3 mins it says copying files and then im able to launch the client. Note this only just started happening a day or two ago. Before that I could load the launcher, log in and launch the client straight away. Been using the new launcher aprox 3-4 weeks. "... ppl need to get out of caves and they will see something new... thats where is eve placed... not in cave..."-á | zoonr-Korsairs |-á QFT ! You should absolutely install in an empty folder - not where your existing install lives. The shared cache will be the same as your previous install, it won't download all the resources again.